B. Thomas (Arlington, Texas, United States) on 28 December 2013 in Animal & Insect. We are lucky to live in a quiet place where there's a field and a thick, brushy wooded area behind us, even though we are in a large city. We are often rewarded by being able to sit quietly within sight of these beautiful, interesting, and entertaining creatures. The foxes observe us occasionally, but as long as we make no sudden, threatening moves or noise and remain at a safe distance, they will usually go about the business of searching for food. 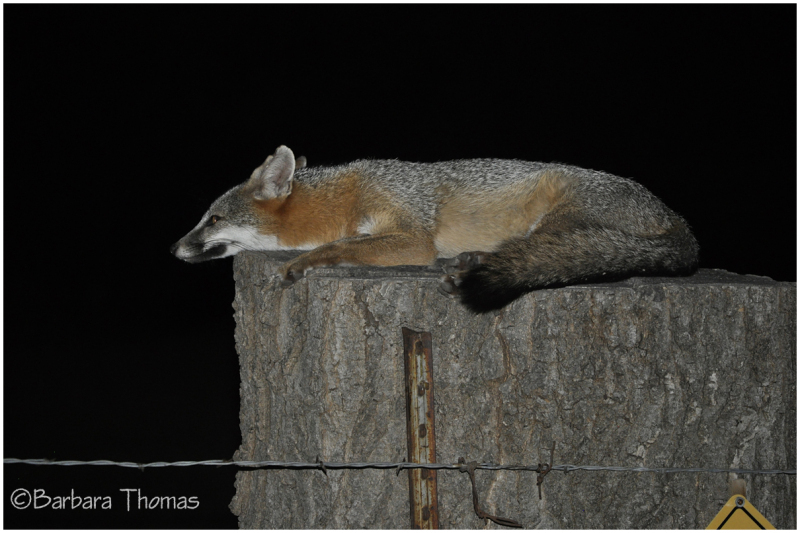 Spending time outside with the foxes or watching them from the windows is one of our favorite things to do. You are truly blessed. The Fox series has been fun and entertaining. Wonderful!!! Is he crouching to pounce on something, I wonder!!! wow, that´s quite a catch! Il a l'air relax ! belle prise. An interesting and very different capture of this fox. He looks so relaxed. What a lovely relaxed pose you have captured. How wonderful to be able to observe them so often. Il domine son territoire !!!! belle photo nocturne !! It dominates its territory!! beautiful photo Night !! Hello, Barbara! Everyone realizes that this fox feels comfortable and safe! Beautifully! Relaxing on the stump. Such beautiful fur. Very relaxed, while always wary. Great pose on this one! You really did well with the light conditions too.